Payoneer, which has offered a prepaid debit MasterCard as a commission payment option for networks and affiliate programs, launched the Payoneer Affiliate Card during Affiliate Summit West 2012. The Payoneer Affiliate Card, like the original Payoneer card for individual networks and affiliate programs, enables affiliates to receive commissions faster, safer, and more cost effectively than checks, wire, and even EFT/direct deposit. But with the Payoneed Affiliate Card, you can receive payments onto the card from any of their thousands of partners. Affiliate Summit Central 2012, starting on Tuesday, May 15 at the Hilton Austin, is now sold out. This conference makes it 20 times in a row that attendee registrations for Affiliate Summit have closed before the event, due to capacity. Check http://www.regonline.com/asc12 for availability. If you’re able to enter your registration — you’re good to go. In the event registrations are open onsite, based on last minute cancellations, the rate will be $129 for a Sessions Only Pass and $249 for a Full Pass. David Gonzalez and Jonathan Herbert of the Internet Marketing Party talked about How to Create the Three Quick Qualification Questions for any situation with anyone… from a networking event to a birthday party at the Affiliate Summit Meetup in Austin, TX on March 27, 2012. It was a really interesting discussion on the right approach when communicating with people for the first time. So many folks are a clumsy mess when they network, so I’d highly advise going through Dave and Jonathan’s slides for strategies and ideas. Thanks a lot to Dave and Jonathan and everybody that came out for pizza and shop talk. By the way, there will be an Internet Marketing Party the day before Affiliate Summit Central 2012. David Gonzalez is the founder of The Internet Marketing Party ™, whose motto is “Mixing Business and Pleasure since 2008? by bringing world-class marketing leaders OUT of stuffy conference rooms and into a cool BAR, for some of the best cutting edge digital marketing information, networking, and joint ventures with some of the most successful and highly recognized names in the online world. David also runs a successful joint venture company (Velvet Rope Joint Ventures) and is the creator of TopStarting (a system that shows you how to build a million dollar Rolodex helping you: “Start at the Top… of your next level in business”). He is passionate about spending quality time with truly world-class talent (in any field) as well as jamming out to music* with amazing friends that makes him dance kinda funny. Jonathan has always marched to the beat of a different drum. One of his biggest passions is connecting with industry leaders who have built their businesses driven by a purpose. His top priority is truly understanding what that vision is and uniting them with other like-minded individuals. He loves to create “the worm hole effect”, where mutually shared goals are achieved in the shortest amount of time possible. And these many resources combine themselves together as one “tribe”. Jonathan Herbert is also the co-founder of Velvet Rope Joint Ventures. His company is constantly expanding its knowledge regarding the people they work with while continuing to attend a wide variety of conferences, affiliate summits and networking events. He seeks out the truly unique “talent” and introduces them to the right people in a very quick, yet efficient manner. Yet, he always remembers to ensure that customer experience is king and that the “white glove” treatment is always applied. Jonathan loves fedoras more than most girls and shoes…and old women with cats. He also enjoys spending time with his wife Jennifer and enjoying a “Five Hour Energy” shot on a daily bases. You’ll find Jonathan all around Austin meeting new people, expanding his network or enjoying his favorite smoothie at The Juice Box on South Lamar. Affiliate Summit Central 2012 is on schedule to sell out in the next week, based on sales patterns of past Affiliate Summits. This will be a different kind of Affiliate Summit – rather than several thousand attendees, it will be capped at a few hundred. The conference will be a day and a half long with two tracks of educational sessions, and a Meet Market with a couple dozen tables. Affiliate Summit Central 2012, the premier affiliate marketing conference, is taking place May 15-16, 2012 in Austin, TX. Maribel Sierra, Social Media and Communities Director, Listening and Engagement, at Dell will be delivering the keynote address. Have a look at the agenda for Affiliate Summit Central 2012 to see the speakers and topics being covered. You talked and we listened! Most Affiliate Summit attendees wanted us to move away from CES and Christmas, and they loved being at Caesars Palace Las Vegas. So, due to popular demand, Affiliate Summit West 2013 is heading back to Las Vegas on January 20-22, 2013. We’ll be returning to Caesars Palace Las Vegas. Yes, that’s right. A postcard from the Ace of Sales affiliate program turned up in my mailbox. If I saw a Google AdWords ad for the affiliate program, it’s unlikely I would have paid attention, but I’ll always read a postcard. I was using direct mail to recruit affiliates back in my early days as an affiliate manager, and kept on doing it until I hung up my affiliate manager hat in 2007. Direct mail was a regular tool for me, because it was very effective. I reached out to Lisa Saline, Affiliate Manager at Ace of Sales, and she mentioned that got the tip about postcard recruiting, because she attended Affiliate Summit, and later joined the Affiliate Summit forum. I love to hear that, and I hope other affiliate managers test postcards, too! Dave Cupples, Chairman of FatCowBusiness.com, will be a keynote speaker at Affiliate Summit East 2012 on Tuesday, August 14, 2012 at the Hilton New York. Dave started his first business aged 4 & by 15 was earning thousands in affiliate commissions. Dave topped the University of Sydney in eMarketing and Marketing Research as well as graduating with First Class Honours in Law and completing internships with J.P. Morgan Investment Bank and Senior Counsel Barristers at the Public Defenders Office. While still a full-time student he turned a hypothetical assignment into a successful online store ApeShop, winning the City of Sydney Business Awards, NSW Small Business Champion Awards, NSW Young Entrepreneur of the Year and being featured on Channel 9 and Sky Business Television. In April 2011 Dave was the winner of SMX idol at SMX Sydney, voted Best Speaker by the audience. Dave has travelled the world speaking at leading conferences including speaking in 2011 at Affili@Syd, the largest Affiliate Marketing conference in Australia, then A4uExpo in Munich, the largest Performance Marketing conference in Europe, then the largest Affiliate Marketing conference in the world, Affiliate Summit in New York City. Dave shares the latest techniques and videos at his internet marketing tips blog FatCowBusiness.com. More details soon on Affiliate Summit East 2012 at http://www.affiliatesummit.com. The speakers for Affiliate Summit Central 2012 are posted, so you can see who will be speaking, which company they represent, and their Twitter name (if they provided it). Check out the Affiliate Summit Central 2012 agenda to see when and on what topic they are speaking on. If you’d like to follow all of the speakers in one shot, you can follow the Affiliate Summit Central 2012 speaker list on Twitter, as well as on Klout and Peerindex. Posts from the Affiliate Summit Central 2012 speakers are also organized in an online newspaper format at http://paper.li/affiliatesummit/1331398249. If you don’t want to have to remember to visit daily, you can opt-in to receive a reminder by email each day. Passes are limited and going fast – don’t forget to register for Affiliate Summit Central 2012. Affiliates were asked a series of demographic questions for the 2011 Affiliate Summit AffStat Report. 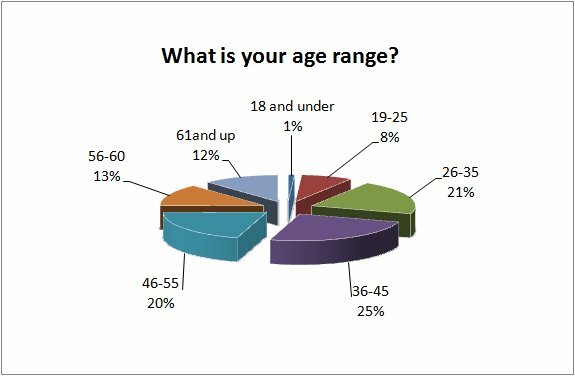 The age ranges were well distributed, and I fall into the 36-45 group, which is the largest with 25%. 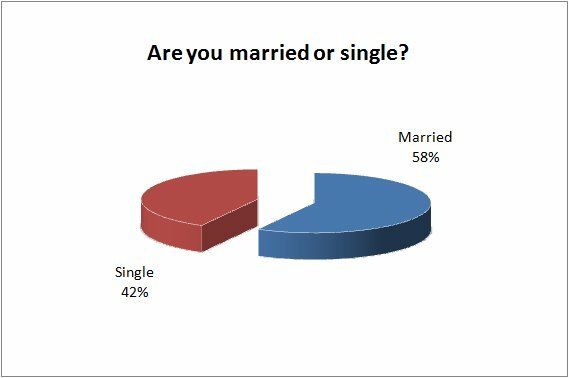 When it comes to married vs. single affiliates, the married folks account for 58%. I’ve always been a married affiliate – got married in 1996 and became an affiliate in 1997. The majority of affiliates have kids, too, with 61% saying they’re parents. I wonder how many affiliates are trying to teach the craft to their kids. I’ve been working on it with my oldest (so far). 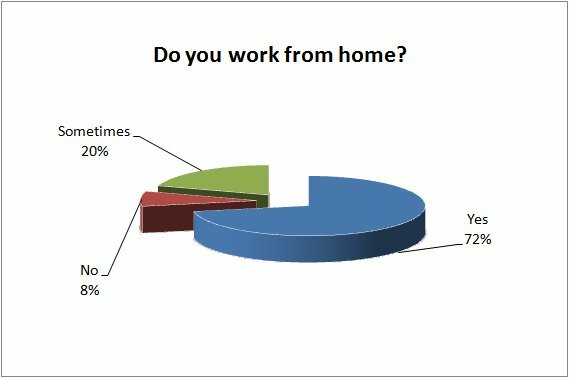 Most affiliates work from home, too, with 72% always working from home, and 20% more sometimes working from home. My first 7 years as an affiliate were while I worked for others, but I’ve been solely at home since 1994. 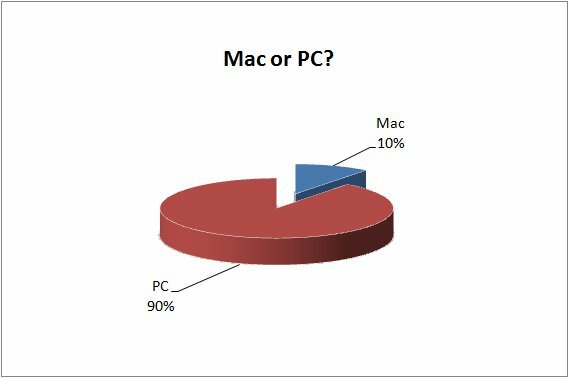 And finally, there is the Mac vs. PC battle, and the PC wins a resounding victory. Cue the Mac users insisting their beloved machines are the best thing ever. I love my PC’s, and yes, I got a Mac years ago to try it out. That “one you go Mac, you never go back” is not true.